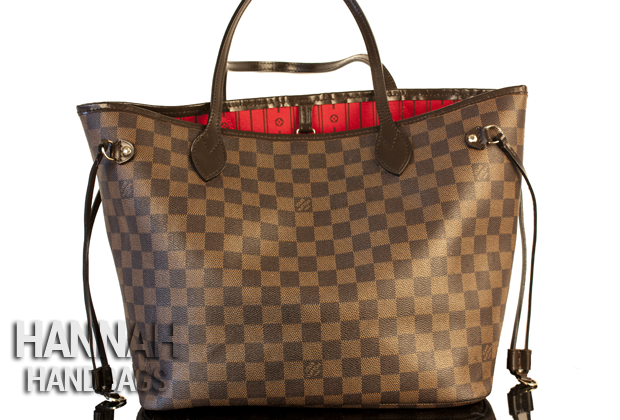 The Louis Vuitton Neverfull MM Damier Canvas bag is one of the most iconic and famous bag of all. It is a design that every woman on earth recognizes, a precious luxury bag that expresses style and refinement. Just like every Louis Vuitton purse, it is a fashion symbol, an accessory that must be included into your wardrobe. 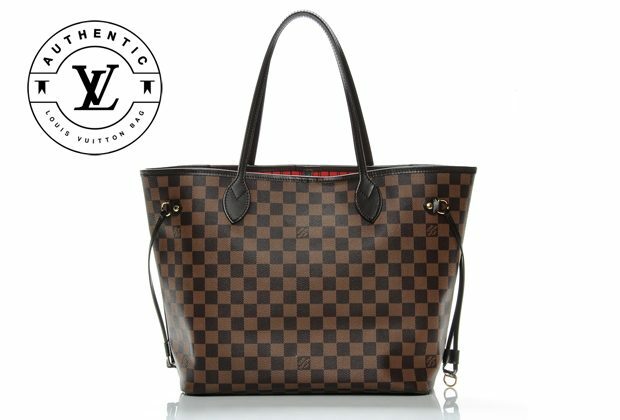 The most important detail about the Louis Vuitton Neverfull MM Damier Canvas bag is its price. This timeless designer bag costs about $1400, a price that isn’t accessible for most of us. Still, everyone who loves fashion and style deserves the chance of wearing such a beautiful item so what solution do we have? Simple! A good quality replica of the Louis Vuitton Neverfull will pretty much satisfy our desire of owning this superbly crafted purse. The MM version is actually the medium size of the Neverfull and it measures 32 centimeters wide, 29 centimeters tall and 16 centimeters in depth. This is the size that I find to be the most practical one, the most versatile and suitable for a woman that has a very active life style. It will easily accommodate an ipad, a heavy camera or any other large items. Also, the other available versions are the GM which is the large size and the PM which is the small size. As you can notice from the pictures of this Louis Vuitton Neverfull MM replica, the straps are very this, a huge contrast considering the big dimensions of the bag. If the bag carries too much weight then these thin straps will hurt your shoulder. What I got to hand it to it is that even though the straps are incredibly thin, the material is so resistant that it will support any given weight without problems. The Louis Vuitton Damier Canvas is pretty famous. The checkered pattern is one of the most easy to recognize brand symbols around the globe. 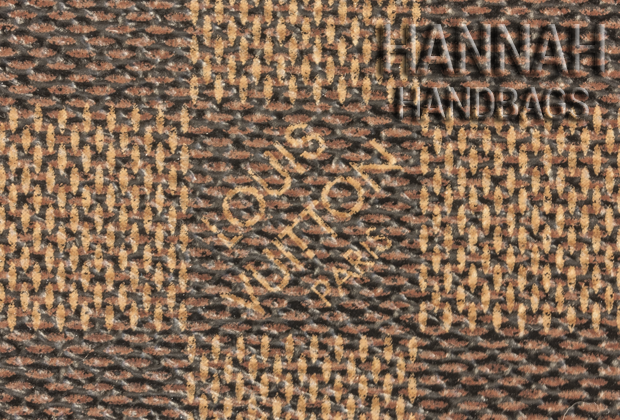 When we see a checkered fabric on a bag we immediately think it must be a LV model. 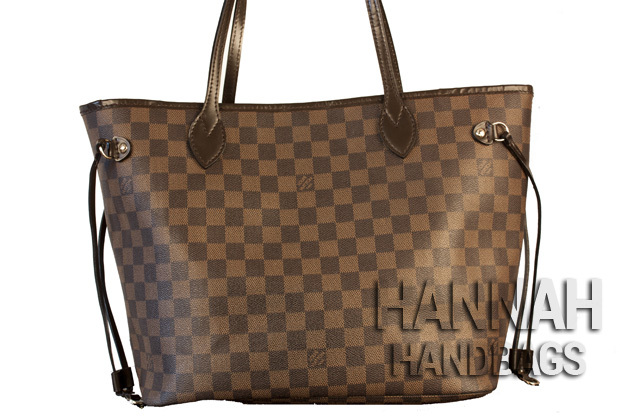 This Neverfull replica comes in brown color and has a deep red inside lining. Its shape is a rectangular one with a smaller base. This simple appearance is representative for the style and grace of Louis Vuitton designs. On the sides of the replica you will notice the same straps as on the original LV bag. These straps can be used to adjust the size of the bag. To make it smaller simply pull the two side straps, to make it larger just reverse the operation. 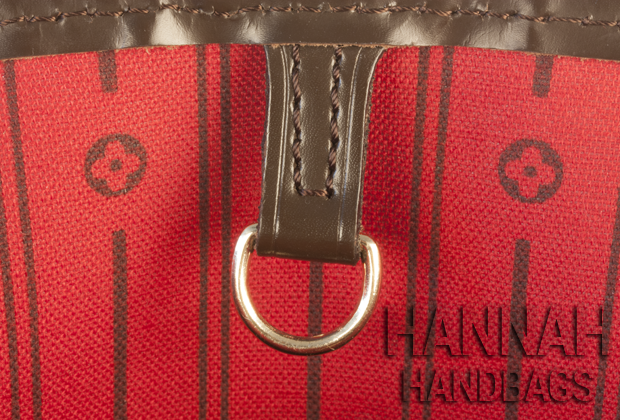 The bag has dark brown color stitching. As you can see from the photos the stitches are evenly spaced apart, straight and symmetrical. There are no loose threads or imperfections in the sewing pattern. Inside out, almost every small part of this bag has at least a few stitches to demonstrate the intricately craftsmanship needed for making a fabulous Louis Vuitton Neverfull Damier Canvas bag. The replica bag seems pretty resistant to everyday wear as it appears to have the same shinny coated canvas as the authentic LV. This canvas can be cleaned very easily with a moist cloth. The shiny coating also gives firmness to the purse and allows it to stand by its own. It is definitely a sturdy, well-built bag that will be perfect for work, going out, going shopping or carrying baby items. To make it short, it is more than a handbag. It is the perfect companion. 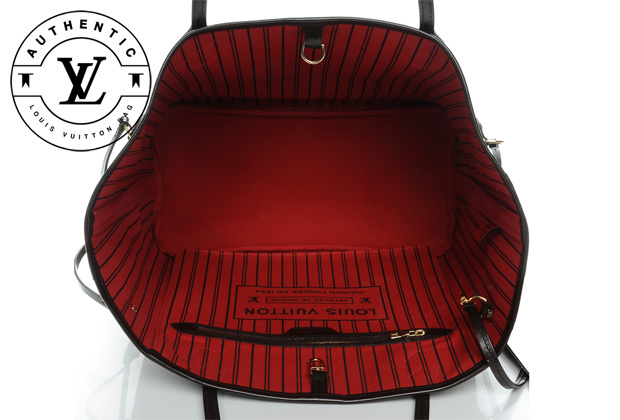 At the interior of this Louis Vuitton Neverfull MM Damier Canvas replica there is the eye-catching red stripped textile lining enhanced by an extremely large inside zipped pocket and by a D-ring that can be used to secure your keys or any other small accessories. 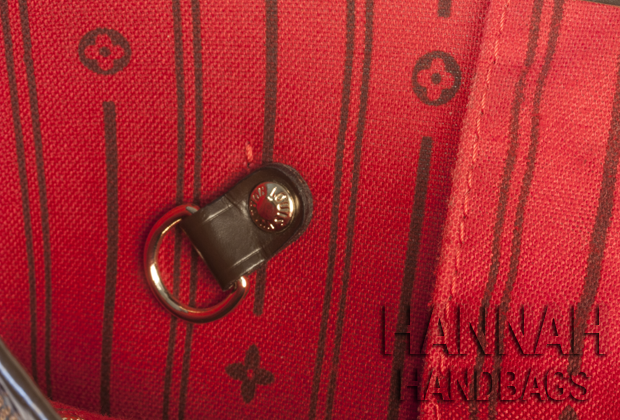 The D-ring is marked with the “LV” logo while the red textile lining is printed with a very big text saying “ARTICLES DE VOIYAGE Louis Vuitton 101, CHAMPS ELYSEES PARIS”. 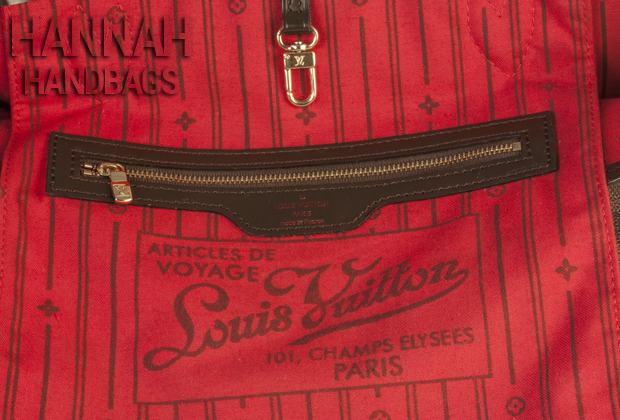 Also, the leather boarder of the zipped inside pocket is stamped with “Louis Vuitton Paris Made in France”. Inside the Louis Vuitton Neverfull, behind the flap pocket there is the date code. This is formed by two letters and 4 digits symbolizing the country, the week of the year and the actual year when the purse was manufactured. The hardware is made from stainless steel and is plated with gold color. The craftsmanship of the metallic pieces seems to be really good. The studs, the claps, the d-ring and the zipper are all marked with the LV logo or name reinforcing the overall authentic look of this Louis Vuitton Neverfull replica bag. After examining this Louis Vuitton Neverfull MM Damier Canvas replica I have to say that it is a fairly decent quality replica. It is made from high end materials, the craftsmanship is well done, and it features the authentic logos and markings. The measurements and feel are pretty good and, frankly, it looks very nice. All things considered, it was quite an excellent purchasing decision. I just have to post about my experience buying replicas from a girl named Mish. I buy all my designer bags and shoes from her. She is an English native, so communication is absolutely easy. She is informative and patient – and is extremely meticulous. I own many authentic bags and shoes, and I must say that her bags and shoes are absolutely amazing. You cannot distinguish them from the authentic – I swear by her as her quality is even better than the authentic! I bought a Chanel Classic Flap from her (25cm) and compared it with the authentic one I have, and there is not a single difference. I am in awe. Delivery was 3 days to me (USA), and it came right to my door with DHL! She accepts all payment methods including PayPal. Be sure to email her! Hi! I could have sworn I saw a review of The Row Ascot on your site and now I can’t find it! Can you post the link and a good replica store to get it from? This is a very well made bag, roomy and stylish, I’ve ordered azur color from bagsvista and changed my mind later. I returned it and ordered the damier ebene color which is perfect. This is an awesome company to work with. I want this bag… but I am feeling weird sending them money through Western Union… especially when its a cash pick up too. Why can’t these oversea sites you paypal?? I bought the signature LV bag from bagvista. The smell… UGH I had to let it air out in the garage for a week- the smell of plastic or whatever was so strong. Also, the leather looks cheap. I guess you get what you pay for! It’s a good idea to test a small spot before trying this method, in case it stains. Hi I was wondering if the replica also has some sort of serial number stitched or pressed any where on the bag? Hey David, No, there were no serial number on this replica. Hiw much the price and can buy online ? Hey Mery, I’ve bought it from here. How much for the medium tote. Is there shipping. Please give total cost and time to receive. Thank you. how do i purchase this bag?? Hey Kelly, I’ve got the bag from this store. I think they have it also in Damier Azur. Yes! A good 5A replica will have a datcode under pocket/flap up in right corner . I ordered a bag from Bagsvista and was asked to send my money to an individual in Ukraine. I can no longer find the website. Should I cancel my transaction. Can you share your bag pictures and link ? Anyone buy any Epi Leather LV neverfull? Or thoughts on these sites? Where are you ordering yours? Do you have a recommended place to buy a Neverfull replica?? Well they do now Girl! LOGOS placed perfectly, squares on sides match & even lighter thread is used for side seams.. Does anyone know if look at my bags has changed it’s name on Amazon? Is there anyone out there that could duplicate a bag without “logo-ing” it? There are several high end designer bag designs that I love! I need a good quality but don’t really care if anyone looking can tell “who’s” bag it is. Even if the color were different or a laser cut out were different (i.e. instead of the circle with the “H” in the middle of it that’ currently displayed in a Hermes bag, for me an empty circle or an “M” in the circle would work), I would be so happy. Any suggestions? I’m almost 60 and would love a really strong, well made leather/or coated canvas bag that looks great and lasts awhile, for once. Thanks in advance for any suggestions. Please contact a very good leather bag manufacturer in China- they sell good quality replicas without the logo. Pls let her know you’ve been referred to her by Zaia. Reviews are awesome, leather, sides match up, Logo 5 squares from top & 11 from sides bla bla bla…..
Hey Tara, Amazon is always better than regular online store. But as far as I know, you can’t buy knockoffs from Amazon. does it worry you having to pay by western union? In your opinion, which seller has better quality bags? Bagsvista or AAAHandbags? I’ve also heard about Designer Discreet – what are your thoughts? Hey Gina, I think that quality of their handbags is the same. Hiw much does it cost? And how can I buy? Hey Marirr, I’ve bought it from here. It cost $179 plus shipping. Hey Pat, I would order because I already got several bags from them and the quality is great. Hey Hope, That’s what they say in return policy. If you don’t like the bag, you have 10 days to return it. I didn’t have to return anything to them, though. Hey Liz, I’ve bought it from this store. Has anyone ordered from aaahandbags.se? I’m looking to purchase the neverfull in Damien azur. Thx! I am also wondering if anyone can answer above. Thx! what are the best websites for a guy to buy bags/watch and other luxury goods? Check out my replica handbags store reviews. The higher the score, the higher the chance of getting high quality bag. The Purse Valley is permanent closed or you believe it will re open with another domain? do you believe that a high end replica can look exactly like the original? or an authentication specialist can always tell if the bag is authentic or a replica? Hey Vi, I don’t know if Purse Valley will ever come back. So far I didn’t see their new domain. High end replica has fewer errors than low quality one, but any replica has flaws. Specialist can always tell if the bag is genuine or fake. Pursemall.ru seems a lot like Purse Valley but I’m too scared to order bc i got screwed by another site (ireplicahandbags.com). Any info on PurseMall.Ru? Hey JY, in my opinion this site is nothing like Purse Valley. I’ve been reading your blogs and I really like how you give an honest review. This blogpost has made me want a bag the same as yours but it’s my first time buying a replica and I’m not sure how reliable bagsvista.co is. Can you please let me know if it is safe or not and if you used Western Union as a method of payment? Hey Charlotte, Yes, Bags Vista is a trustworthy store. I paid with western union payment for this bag. It was my first time buying a replica too but i bought it on aliexpress. I found out about them by accident. At first I was just browsing some bags on Aliexpress and saw this bag that is blank like a plain black bag and they were selling it for around CAD200 and saw the 5 stars reviews and reviews were very positive praising the quality of the bag on the picture. Of course I was dumb and had no clue as I never bought a replica before haha so I messaged the seller “Why is this so expensive?” She replied to me asking me for my email. So I sent her my other email (the one i use to pretty much public stuffs) I’m paranoid sending personal stuffs to strangers so I have backup emails in cases like this :)) so anyways, she sent me a link to a website full of replicas. LV, Valentino, Gucci, Celine, Chloe, Hermes. The products are so beautiful on the pictures like so beautiful. You’ll see the details of each bags on the site. Mind you, I studied every details of the bag on their website and comparing it to the authentic website. Not gonna lie some of the products are not perfect but you’ll know which are the perfect replicas are because they costs a lot as compared to the “not so perfect ones”. Just do yourself a favour and do your research on the authentic ones and compare them on what’s on the website so you won’t complain anything later. Anyways, a good thing about buying on Aliexpress is that you can get a refund if you didn’t get your item that to me is safer than sending your money to western union. Sorry that’s scary just writing my experience in buying my first replica bag as we are talking about replicas on here. I bought a LV capucines PM in magnolia and the bag is perfect in every way! Leather divine! What was the sellers name? Who is did you purchase from on Ali? I’m waiting for merchandise now. What store on Ali did you buy from? Hey Mia, Most of the new replica bags have this specific smell. I just leave it to hang outside for a couple of days and the smell goes away. Alternative method is to use a few drops of commercial leather cleaner and odor eliminator on a cloth to wipe the bag. How is the quality of your replica? I am thinking about purchasing one from bagsvista. I actually sent mine back. Besides the smell it just looked fake. The light brown was off and from far away it didn’t look like a Nevefull at all. I’m just going to save up and buy the real thing! Hi Mia,,, i want to order one,,how did you find the quality of the bag? Is it good? Fo you recommend it ? Shame on you! Not even a 4 rating! I received today even though I cancelled and the sides and bottom of the bag are not even close to the authentic or a decent replica! Hey Linda, I’m sorry the bag didn’t meet your expectations. Why do you shame me? I posted 7 image of this bag and IMHO it looks good. Hi Hannah how long after purchasing from Bagsvista does it take to leave the warehouse and ship? i purchased the bag a week ago and no information yet on them shipping the bag. Sorry to ask another question but why is the lining in your pictures different from the original and even from the lining pictures on bagsvista.co? The pictures you are showing have little flowery cross looking things. Those are not on an original and not even on the pictures on their own website? Thanks. 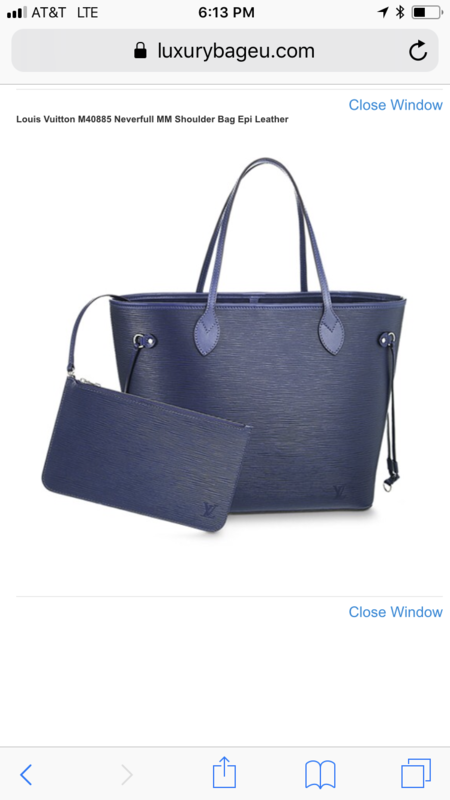 Hey Linda, I think they removed Neverfull with this kind of lining from their site as I can’t find it either. 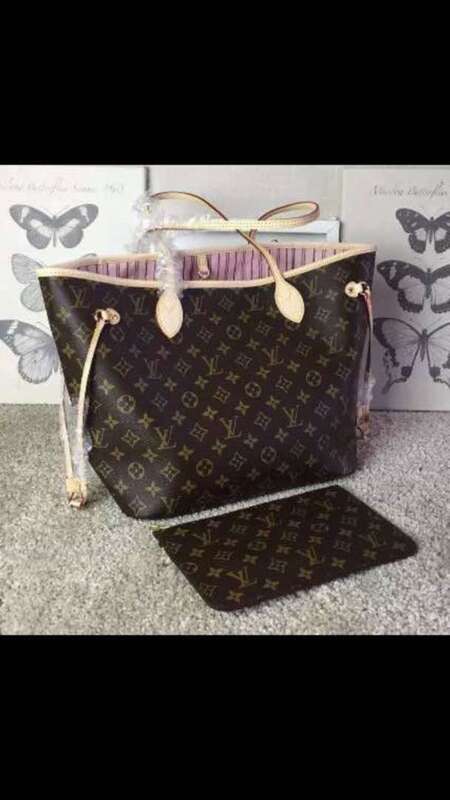 Hi Hannah, I have been looking for a replica Louis Vuitton Neverfull mm and just wanted to ask you which sites you recommend? So far the ones I have found only accept western union, so I definitely want to order from one that’s trustworthy. Thank you for your time! Hey Morgan, I’ve noticed that recently less and less stores accept credit card payments. My Neverfull handbag was purchased from this store. I purchased a LV neverfull from a site a while back and love it. So I wanted another bag they did not have. Well I paid te 2 person relicasales.com email [email protected]. They scammed me. They emailed and said they do not have the purse and told me to pick another one I said I donot want another one and they will not refund my even though the site says they refund and 100% guarantee. I am so upset. I am about to order the Neverfull MM bag off of bag vista and wanted to make sure you did not have any issues ordering from this website and it was a legit company. Did you order this bag? Did you get it? Was it good? Did you order from bag vista? Was it good? How was the quality of the Neverfull from bag vista? Are you satisfied and would you buy from them again? Is this a new site? I was going to order from AAAhandbag? Is the AAA handbag reputable they want you to pay with western union that feels risky. Hey Hannah, do you have pictures of the side of the bag? I find that with many replicas, the sides where the seam is, does not match up symmetrically. Wondering how yours look. Thanks!